So, as you know I have been absent from the blogosphere for a couple of weeks. I am not 100% sure of all the reasons why. 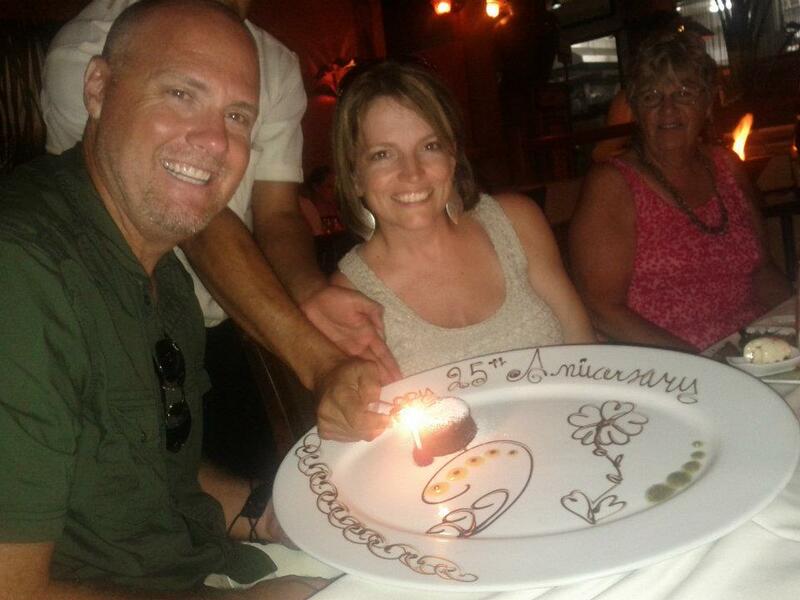 Some of them are simple like, I was in Mexico celebrating my birthday and 25th wedding anniversary. Some of them not so simple like, feeling unmotivated and overwhelmed. And then there is just plain busy. But, I am here now and how I have missed you. Without further ado, here is the post I promised you before I left on my trip. These are the vows I made to Kent Krabill on the occasion of our 25th wedding anniversary. 25 years ago we agreed to be there for each other. We agreed to be the witness to each other’s life. We promised to care about everything; even the small things, the good things, the bad things the mundane things. Over the years we have learned things about each other that have surprised us and we have learned things about ourselves that we never dreamed possible. For example, I learned that I like basketball and you learned that you like So You Think You Can Dance. When we got married I expected that we would love each other forever, that we would have fun together, make a family and be best of friends. What I couldn’t have predicted were the ways in which you would evolve to become the man that I love more than I could have imagined at 18. I love all kinds of things about you. I love the way that even when you think you are 100% right about something you still walk away and consider that you could be mistaken and I love that you shift if you learn that you were wrong. You are not afraid to say you are sorry or to ask for forgiveness and you always tell me you love me. I love that you still bring me flowers. I love your creativity and problem solving ability. I love the way you take care of the money and how generous you are. I love that you like to go places and do things. I love your passion for people and the way you choose to do things you really don’t want to do to bless someone else. I love how excited you get about racing and basketball. I love that you want to give our kids great experiences and teach them how to live a full life. I love that you like to eat good food. I love that our kids playing music is important to you. All of these things I love about you point to your love of Jesus and your love of people that drive you to be who you are and do what you do. I love you for all of these things and a million more. I also love the things I have learned about myself because of you. I have learned that I am stronger than I think I am. I have learned that sometimes I need to be willing to get worked up over things I believe need to change. I have learned that I am a good writer and a good speaker. I have also learned that I am adventurous just not the kind of adventurous that jumps out of planes. I am the kind of adventurous that moves half way across the country with two babies so her husband can go to law school. Most of all I love what we have become together. I love that we are one of the most “we” couples I know. I love that the people who know us know how much we love each other. I love that young people want to be like us. I love that we made amazing beautiful smart creative crazy extroverted kids together. I love that we have family hobbies. I love that we can watch basketball and dancing and idol and Brave and Mission Impossible and love them all. I am looking forward to our future together. I am looking forward to finding more things to love about you. I am looking forward to the things you will help me discover about myself and I am looking forward to seeing Caedmon and Rosalind become who they were always meant to be. Mostly I am looking forward to being with you though all of it. Becoming more myself, as we become more us. Isn’t that the magic of it all? Because we are together we get to be more of who we were always meant to be. But these are supposed to be vows where we make promises to each other about our future. So today I promise all over again to love you and to notice all the things that happen in your life. I promise to be your witness. I promise that I will hold you up when you are weary; That I will hear you when you are frustrated; That I will laugh in your joy and cry in your pain. I promise that on all our adventures you will find me right where I always am, right next to you. I promise you that even when I discover something new about you or about myself that it will never change my commitment or love for you. You know I won’t be perfect, and I know you won’t be either and some times our dance will struggle to find the music but know this, I will be there. I will be the one stepping on your toes until we find the melody again. You see we have a quantum entanglement. We are an us, always. So again I promise that I will be part you. And I promise that you will be part me. And I promise that I will love you always.